The cost of treating British people who become ill while travelling in Europe is five times higher than the cost of treating ill visitors from other European countries in the UK, official figures show. 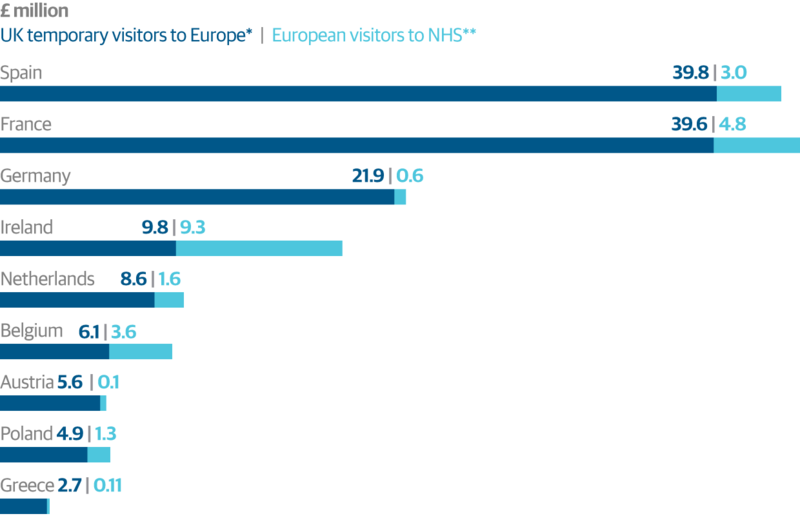 The Department of Health data, obtained under the Freedom of Information Act, shows that it cost £30m in 2013-14 to meet the costs of European visitors using the National Health Service. This is less than one-fifth of the £155m cost to other states in the European single market for treating ill British tourists. The figures for costs are for the medical treatment of European Economic Area tourists under the European health insurance card (Ehic) and cover visitors rather than residents or temporary migrants, but critics say they “puncture a big hole” in claims that health tourism is costing Britain dearly. A £200-a-year health “surcharge” was introduced this week for all new migrants from outside the EEA who stay in the UK for longer than six months. The surcharge, which is £150 a year for overseas students, is payable upfront andcovers migrants for the duration of their visa. Ministers have said the Department of Health is working on plans to charge those non-EU patients who are not subject to the health surcharge 150% of the cost of NHS treatment. EU migrants working in Britain pay for NHS treatment through their tax and national insurance contributions.